You can't have a Super Bowl party without...Chicken Wings!! 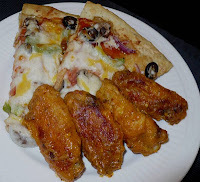 Pizza and wings are a favorite meal for a lot of families. What you might not realize is that making this meal at home is cheaper, healthier, tastier and not really a lot of work. This is also a fun project for families to make dinner together. My family and I have worked on this recipe for several years, tweeking it a little here and there each time. Now it is football-food perfection! Try these wings on their own or with a do-it-yourself pizza for your next football party and you will not be disappointed. 12 Chicken Wings, cut into drumettes, center wing pieces and wing tips (discard tips) You will have 24 pieces total. In a large bowl combine all of the dry seasonings. Working in small batches, dredge wing pieces and place wings on a sheet of Reynolds Wrap® Non-Stick Aluminum Foil. Let the wings rest for 5 minutes, then dredge a second time in the flour/cornmeal mixture. Replace wings on foil. Cook in preheated 425 oven for about 45 minutes, turning once about 20 minutes into cooking time. After wings are cooked, cool 5 minutes then apply the sauce below. Melt butter in saucepan then add red pepper flakes, garlic powder, salt and pepper. Heat and stir until you get a roux consistency. Add Franks Red Hot sauce and vinegar and heat to just under a boil. Simmer for 10 - 15 minutes on low heat. Dip cooked wings in the sauce one at a time and coat thoroughly with sauce and place in serving bowl. 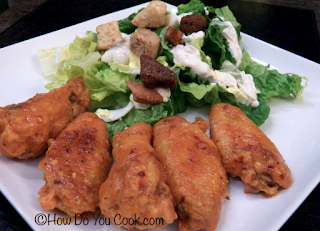 These wings even taste great when served with a simple salad with Blue Cheese Dressing. Use the same dressing as a dip for the wings. Enjoy!! This would be a wonderful things to serve for the upcoming ball games. I definitely prefer baking the wings and will try non-stick foil the next time we serve them. Thanks so much for visiting my blog and for leaving a comment. I'm so happy to meet you. Sticky, spicy, yummy looking wings without deep-frying! It sounds like a miracle! What substitute would you advise for the Franks Sauce? These are not very sticky but they are a bit messy..lol. You'll need extra napkins for sure. It's tough to find a substitute for Frank's as it does have it's own unique taste, but you could try the recipe with another hot sauce available at your market. Let me know how they turn out! Thanks for visiting. I am making these for the second time. My husband loves them!! No more 'wing shop' wings for this house!! I can't wait to try different types of sauces. Traci - So glad you enjoyed the wings. We are experimenting with a few new sauces so stay tuned!